…wow, it’s still unbelievably cold here in this little corner of the United Kingdom. In the end we had a relatively mild Christmas period but they suddenly, mid-January and the big freeze hit. of course it’s nowhere near as cold as our Canadian friends but for the UK it’s been cold and it looks likely to stay that way for a while. I’m also back at the cottage for the first time in a fortnight and it’s always cold inside until the fire gets going so baking is a great way to keep warm. I’ve baked bread for the first time in a quite a while and really enjoyed it. (How did I ever not know how to bake bread? 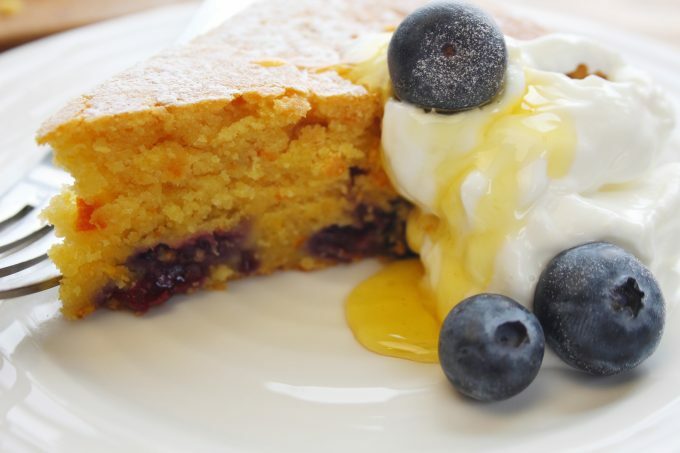 It’s one of life’s most basic and yet important skills and it tastes so damn good…) and of course i’ve also baked this orange, honey, blueberry and yoghurt cake, which is a nice simple one to get back into if you haven’t baked for a while. Happy Days. I adore this cake. It’s light, simple and the perfect balance of sweet and sharp. The whole oranges, with their pith and peel and flesh bring the bitterness whilst the honey compliments them with its amber sweetness. 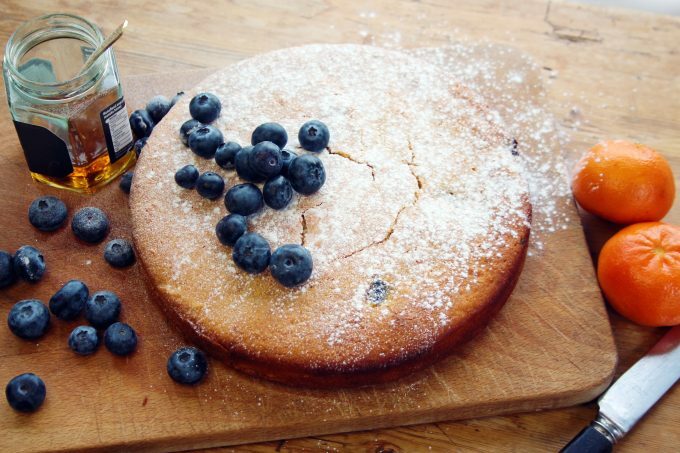 This is one of those cakes you find in many cultures from the traditional Greek Portokalopita Syrup and Yoghurt Cake to the Italian Torta di Arance or the classic Jewish Almond and Orange Cake. All have pretty much the same ingredients, some with almonds and polenta or semolina, others with flour. I’ve used flour here because that’s what I had in my store cupboard but feel free to simply swap out the flour for fine polenta, the texture is divine. 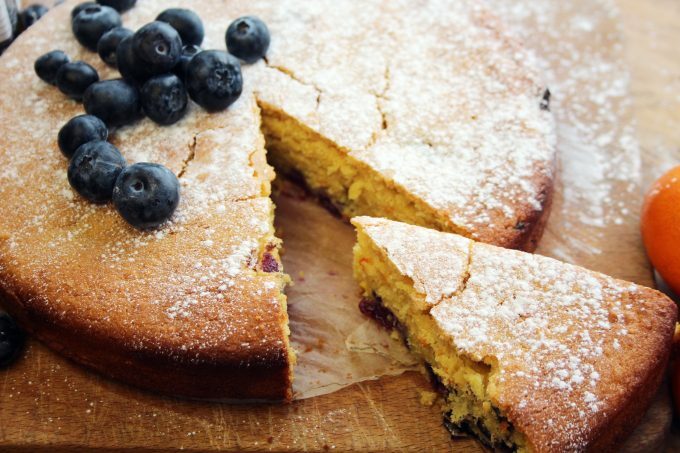 It’s also ridiculously easy to make as it’s an ‘all-in-one’ style cake which means it all goes into the bowl and is beaten together at the same. I also love this cake because it’s like sunshine on a plate and during these glory winter months it reminds me of the Mediterranean, sitting by the sparkling sea and drinking Aperol Spritz! place the oranges in a pan of water and bring to the boil, then turn the heat down and simmer for 25 mins, drain the water and set aside to cool before blending (skin and all) into a smooth pulp – a hand-blender will do this in seconds. It’s been perishing cold here in Derbyshire for a week, but at least we’ve seen a bit of sunshine which is so much better than the grey drizzle we had for weeks before. 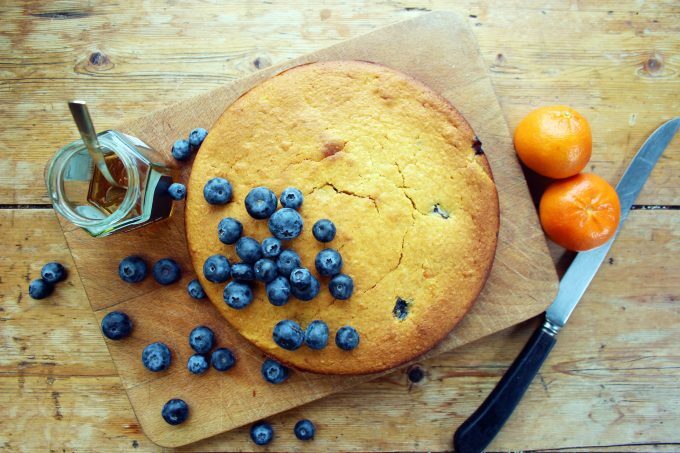 Your cake looks like a plateful of sunshine, I can almost taste the oranges from here! Gorgeous! thanks darling… even colder today! We now have about six inches of snow…..groan…….. However, I made this cake as I happened to have all the ingredients in the house without the need to put my welly boots on and go trudging to the shops! Just taken it out of the oven and it looks wonderful, can’t wait for it to be cool enough to try it!